Burbank is a city in Los Angeles County, California, United States. Kendall Schmidt (b. 1990), actor, singer, formed band Heffron Drive in Burbank with Dustin Belt – part of Big Time Rush (band). ↑ 2.0 2.1 2.2 "City Council". Burbank, CA. Retrieved May 3, 2015. ↑ 3.0 3.1 "City Officials". Burbank, CA. Retrieved May 3, 2015. ↑ "Burbank". Geographic Names Information System. United States Geological Survey. Retrieved November 6, 2014. 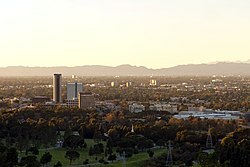 ↑ "Burbank (city) QuickFacts". United States Census Bureau. Archived from the original on August 16, 2012. Retrieved April 9, 2015. ↑ "Glenn Davis Statistics". Pro-Football-Reference.com. ↑ "Mark Harmon: Biography". TV Guide. Retrieved April 14, 2008. ↑ "Jason Hirsh Stats". Baseball Almanac. Retrieved December 3, 2012. ↑ Teper, Lonnie (July 16, 2009). "Greg Plitt". Ironman Magazine. ↑ "Shore, Ryan". Alumni Directory. Berklee College of Music. Retrieved April 5, 2010. ↑ "Anton Yelchin Biography". Tribute. Retrieved May 25, 2009. This page was last changed on 3 December 2018, at 05:07.